On Sunday 21st April 2019 the sun will rise at 05:47 and will set at 20:15. It will be a mild day, with temperatures reaching around 21.9°C. Today is expected to be a dry day, with a very low chance of rain. It will be quite a breezy day, with a maximum expected wind speed of 26mph. On Monday 22nd April 2019 the sun will rise at 05:45 and will set at 20:17. It will be a mild day, with temperatures reaching around 19.4°C. Today is expected to be a dry day, with a very low chance of rain. It will be quite a breezy day, with a maximum expected wind speed of 25mph. On Tuesday 23rd April 2019 the sun will rise at 05:42 and will set at 20:19. It will be a mild day, with temperatures reaching around 13.7°C. Today is expected to be a dry day, with a very low chance of rain. It could be quite a gusty day today, with a maximum expected wind speed of 28mph. On Wednesday 24th April 2019 the sun will rise at 05:40 and will set at 20:21. It will be a mild day, with temperatures reaching around 13.3°C. Today is expected to be a dry day, with a very low chance of rain. It could be quite a gusty day today, with a maximum expected wind speed of 33mph. On Thursday 25th April 2019 the sun will rise at 05:38 and will set at 20:23. It will be a mild day, with temperatures reaching around 11.7°C. A light shower is possible, 1mm of rainfall is possible today. It could be quite a gusty day today, with a maximum expected wind speed of 34mph. On Friday 26th April 2019 the sun will rise at 05:36 and will set at 20:25. It will be a mild day, with temperatures reaching around 8.6°C. A few showers are expected, 3mm of rainfall is possible today. It could be quite a gusty day today, with a maximum expected wind speed of 35mph. On Saturday 27th April 2019 the sun will rise at 05:33 and will set at 20:27. It will be a mild day, with temperatures reaching around 8.1°C. A few showers are expected, 3mm of rainfall is possible today. Some quite strong winds are possible today, with a maximum expected wind speed of 41mph. The guys at Dexters provide a professional, surfing experience, all year round, to people from all walks of life. We are the only ASI accredited School in the north of England making us the leaders in our field for surf lessons. Why try the rest when you can have the best? have a look at our Trip Advisor Page on the left of your screen to see what people are saying about us. 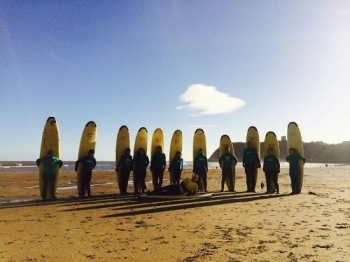 The Surf lessons offered is designed by the ASI team to be educational, rewarding and fun, helping people to try something new, advance on what they know already, or just to get out there in the water and have fun. With a select team of four Luke Austin (Owner) Dreek Peeters, Dan Eland (Managers) and Andy De’sa (ASI Accredited Surf Instructor & SLSGB surf lifeguard) Dexter’s Surf Shop, School & Hire Centre has a very passionate crew, well practised in offering excellent advice, tuition and customer service. Featuring some of the most popular surfing brands in the world, such as Roxy, Quiksilver, Weird fish and Old Guys Rule, the Surf clothing supplied is really high quality and great value. Available in the shop and online, we sell to almost the whole world! If its Surf hardware you’re into, We stock a great range of high quality off the shelf surfboards, as well as custom surfboards from the likes of big companies such as Quiver and Take off, Right down to the small independent shapers, like Cre8tion Surfboards, and AMP Surfboards, who is one of the main custom surfboard shapers in Scarborough.